Make a huge impression this year with this long lasting tree made out of a wide variety of fresh succulent blooms. It is in a cool wooden box and stands at 18". 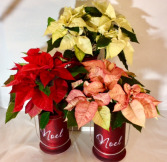 White, red or Monet (mixed color poinsettia), you choose the color! This traditional Christmas plant comes in a glass handled lantern. This makes a great gift for someone special, or keep it for yourself! Winter is here, so spread some cheer! This 6" keepsake ceramic cube has a playful winter scene on it that will surely make someone's holiday! 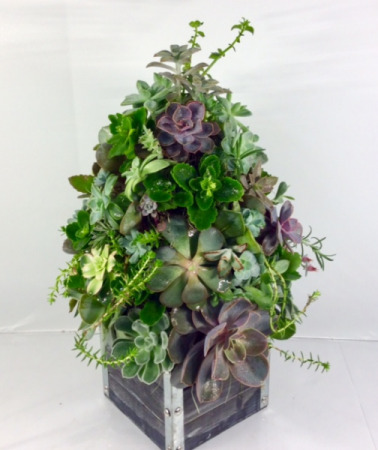 It is filled with fresh evergreens, branches, hydrangeas, roses, silver seeded eucalyptus and red glass balls. Send this festive pine cone snowman on a log keepsake this holiday! 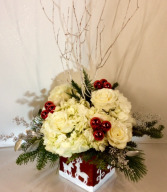 It contains fresh evergreens with red carnations, pine cones, glass balls and glittery branches. check out our "YELP REVIEWS"